What is a bong or water pipe and what is the difference? A bong has the same properties as a water pipe. Both are usually filled with water. The water has an important function, namely the cooling of the smoke. This makes the smoke feel less harsh on your throat. When one speaks of a bong, one specifically talks about a pipe to smoke cannabis. The word water pipe is usually used to indicate a pipe to smoke tobacco. But sometimes the word is also used as a synonym for bong. Other names for this type of water pipes are: Shisha's Nargiles or Hookahs. These are usually used in combination with hookah tobacco. If you don't want a long story about the history of water pipes and bongs, and you would rather buy a bong right away? Take a look at our extensive range of bongs and accessories. In our online store you can order a bong in the most common materials and in various price ranges. It does not matter if you want a cheap acrylic model or an exclusive bong made of glass. For questions you can send us a Whatsapp message or email 7 days a week. We can be reached by telephone on working days during opening hours. What do you need to know to use a bong? You can smoke a bong without water, but the water in the bong ensures that the smoke is cooled and this makes it a lot more pleasant! A water pipe usually has a hose with a small mouthpiece. Most of the content is in the water chamber. A bong, on the other hand, has a large mouthpiece and a wide cylinder through which a larger amount of smoke can pass. As a result, the content is generally considerably larger than with a water pipe. When you smoke weed with a bong for the first time, it will take some time to get used to. You can inhale the cooled smoke faster and larger amounts at the same time. Most bongs are equipped with an air gap, also called kickhole or carb hole. While smoking a bong you keep this hole closed with your finger. At the end you leave the hole open again, which suddenly increases the air supply. This allows you to quickly inhale the remaining smoke from the pipe. Not all bongs have an air gap. This is not necessarily required because the air supply can be increased in another way. The bowl is part of the bong where the cannabis is burned. In most cases it is separate from the downpipe. By removing the bowl from the bong you get a better flow of air and the remaining smoke can also quickly be pulled out of the bong. There are also so-called liftoff bowls for sale. These have a handle so that they can easily be removed from the adapter. Which parts does a bong have? In our extensive range you will find all kinds of bongs. Each kind has its own advantages. An acrylic bong often has a loose downpipe where a bowl is screwed onto. Both parts are made of metal. After all, you don't want to smoke weed in a plastic bowl! The downpipe is the part that goes into the bong. This tube ensures that the smoke is released at the bottom of the water. Some downpipes have one hole at the bottom, the advanced models have several small openings. This ensures that the smoke is divided into smaller bubbles at the first contact with the water. As a result, the smoke cools even faster. The most favorite bong among cannabis lovers are made of glass. With a glass bong, the downpipe and the bowl are also made of glass. With the cheaper bongs you often see that the downpipe and bowl consist of a part. Glass bongs have several advantages over other materials. A glass bong will not affect your smoking experience, because glass is fragrance, smell and tasteless. It is a beautiful sight to see the smoke flowing through the bong. The diversity is very large, and the more luxurious models are a pleasure to look at alone. The number of accessories you can buy for a glass bong is huge. Thanks to the built-in and additional accessories, the cooling of the smoke is very effective. There are two theories about the origin of the water pipe. The first is that it is originates from Persia. The Persian poet Ahli Shirazi wrote a poem, around the year 1500, in which the water pipe was already mentioned. Probably the water pipe originated from Persia and from there it was spread to India and via the Ottoman Empire eastwards to Europe. A second theory is that the hookah arose after the introduction of tobacco in India by the Jesuits. Emperor Akbar's court physician, Abu'l-Fath Gilani, worried about the health of nobles after smoking tobacco became popular in India. Gilani had invented a device that allows smoke to be carried through water to be 'purified'. 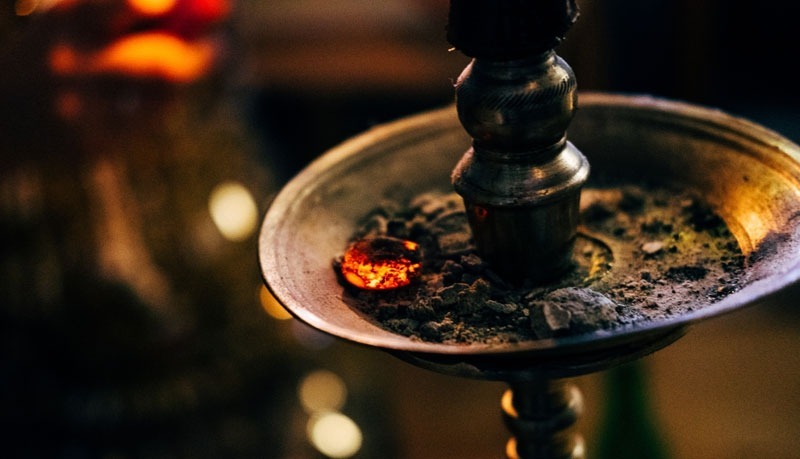 It was not long before noblemen used hookahs throughout India to smoke tobacco and eventually the water pipe became a symbol of the Indian aristocracy and nobility. Nowadays you can find water pipes in restaurants and shisha lounges around the world! The word bong derives from the Thai word 'baung' which means wooden cylindrical pipe. It is no secret that cannabis was used during the Vietnam War. Cannabis eventually grew in the wild. There are even video fragments of soldiers who used their shotgun as a weed pipe. The word baung or bong is probably introduced by Vietnam veterans in to the U.S..
Are you ready to order a new bong? Apparently you thought it was worthwhile to read our explanation about water pipes and bongs. Thanks for your attention! Now you are ready to order a beautiful new bong. Do you still need help with selecting a suitable model? Or are you still having questions? Feel free to contact us!